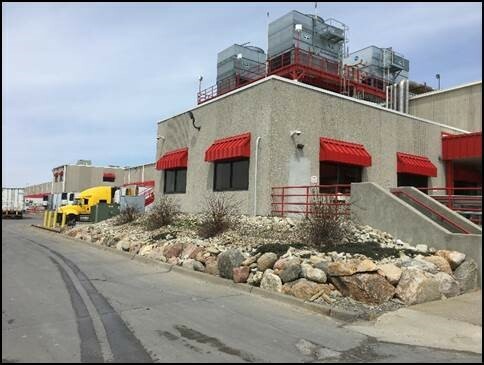 The Hy-Vee Chariton Distribution Center sits on a 95-acre campus, which consists of a 700,000-square foot grocery warehouse, a 435,000-square-foot perishables warehouse including both produce and frozen items, and a 120,000-square-foot health, beauty, cosmetics and pharmacy warehouse. More than 24,000 items are offered for retail delivery from the warehouses. 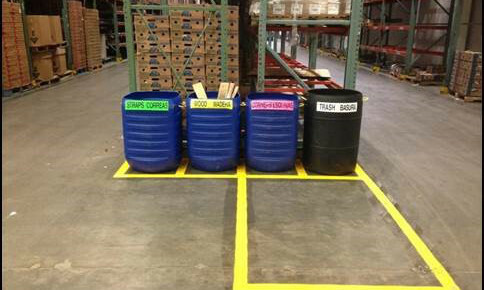 Warehouse operations move approximately 1.75 million cases of product on a weekly basis. On campus is a graphic production department with a print shop and sign shop that provides simple design work and a variety of printed items for Hy-Vee's retail and distribution locations, including convenience stores, pharmacies and restaurants. A thorough review of all aspects of waste generation in every area of the facility to ensure materials are being diverted via the highest method possible on the zero waste hierarchy. A new paperless payroll system and Warehouse Management System platform were implemented to maintain control of inventory levels of all product, while also helping the distribution center reduce paper. A temperature recorder program using reusable RFID (radio-frequency identification) tags for all temperature sensitive loads was implemented. Numerous reusable items, such as plastic pallets, plastic hinged totes, RPC’s (reusable plastic containers), bread trays, soda trays, etc. 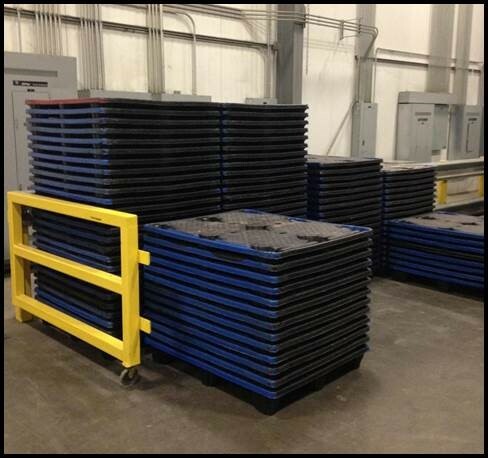 are used for the transportation of goods to stores. Compostable materials are collected separately from other materials generated in campus break areas. This same compost is then distributed and sold through Hy-Vee’s retail stores. Organic waste from warehousing activities is processed through an off-site service provider’s anaerobic digestion facility. 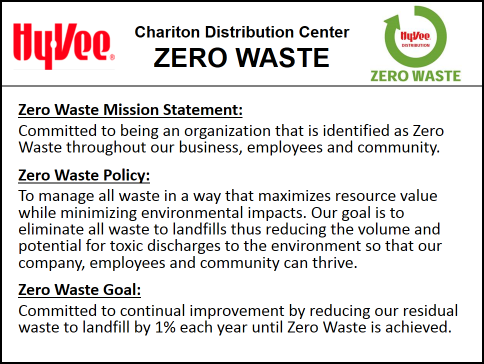 Implemented practices and programs including an Environmentally Preferred Purchasing guidelines, sustainable grounds keeping requirements, inter-office supplies reuse process and partnerships with numerous local organizations to donate applicable salvaged food waste, animal food waste and salvaged cat litter. 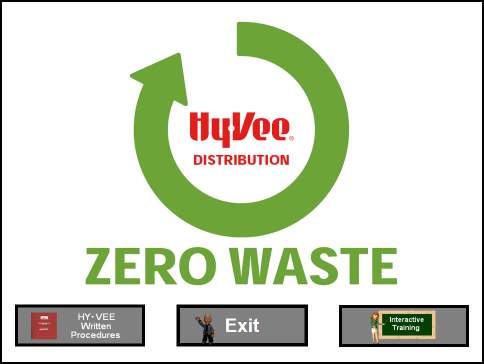 An in-depth zero waste training module was created and implemented as part of the Hy-Vee Chariton Distribution Center’s annual training program for all site employees.